There was an off menu item served on this occasion. The French Couple ordered two salt lassi. They initially said they don't make them, then said it was possible for us. I being particularly thirsty (I'd already had a Limca and a Thums Up) asked for a lassi, also. This order launched a mini discussion how often when we order a salt lassi anywhere, they want us to consider instead a sweet or a Mango lassi. I guess they have had problems with the uninitiated not liking a salted yogurt drink. You have to press a little harder that you sincerely want a salt lassi. Often they hang around to watch your first sip probably expecting a wrinkling nose and I refuse to make meet their expectations. When HH did bring the lassi, they said they were not salted but we could add salt at the table. I tried it as-is, which tasted fine, then added a ceremonial amount of salt and drank it happily. Vital Information wrote: [...]I am not sure any other places on Da'Bomb offer a complimentary bowl of drecky egg drop soup. J.K. Kabab House does, and I have found it to be even more "drecky" than that of Chopal. The wife and I went to Hyderabad House for dinner and we loved it. We ordered lamb curry, chicken biryani and, of couse, Limca. It took us a while but we finished it. Dinner tab, $13. Everyone was friendly and kept asking if we needed anything. I will have to go back and try more. I kept seeing different dishes coming out of the kitchen and they all looked good. I had it at Hyderabad House, and the nice man behind the counter described it as "beef crumbles," and it was certainly beef, but it was...fluffy, very light. There was a definite gingerbread note. No sauce. I liked it quite a lot. I've tried calling Hyderabad House several times, but no answer. So what did I eat? JimtheBeerGuy & I & our kids are going to this restaurant tomorrow night...we're looking forward to some great food! If I'm lucky, I'll remember to bring the camera. And if any of you would like to join us, we would love the company. Saint Pizza wrote: JimtheBeerGuy & I & our kids are going to this restaurant tomorrow night...we're looking forward to some great food! If I'm lucky, I'll remember to bring the camera. And if any of you would like to join us, we would love the company. Events board is the best place for this announcement. Ideally, provide a link back to this page, address and time. Don't forget to leave the beer at home. David Hammond wrote: What did I eat? It does sound like keema, indeed. And although I was at first thrown off by the gingerbread comparison, I can see how that could be tasted given the addition of those spices. 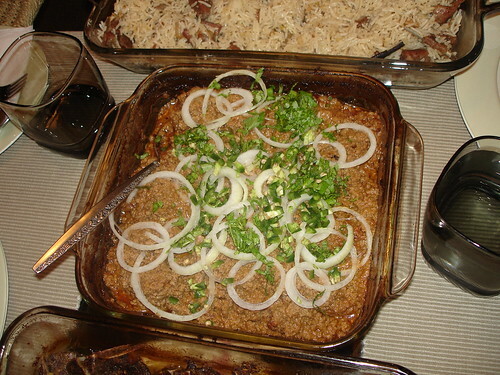 Keema it could very well be. Yes, tatterdemalion, it did look like what you made; I suspect there could have been cloves in there and cinammon quite definitely, zim. thus will pass on the "gossip" as I heard it (sad though it may be). and there is talk of potential change in ownership etc. Saint Pizza wrote: JimtheBeerGuy & I & our kids are going to this restaurant tomorrow night... And if any of you would like to join us, we would love the company. That's the thing about the Events board: if you're not actively cruising it, you can easily miss out on some great events. I know that we're against double posting on LTHForum in the strictest sense, but what about allowing a really short heads-up about restaurant-related invites in the relevant forum threads? Maybe not duplicated summaries in every Hyderabad House thread found through the search function, but what about a brief description of when and a link to the Events board post with the rest of the details and attendance discussion (in just one referring HH thread possibly)? Sure, that means Events announcements might be mixed into the original restaurant thread(s) a bit, but at least folks who are watching replies to HH threads might become more easily aware of HH events, for example. Just a thought. I'll double post in the Site Chat forum if that's where discussion should be held on this. When I visited HH with Saint Pizza and JimtheBeerGuy, there was that gentleman who stopped by later during our meal and took what seemed like an extra effort to accommodate us and enhance our dining experience. When I asked about the pool table pushed over to the side wall, he informed me that they (those in management?) were thinking of taking it out altogether and adding more tables for actual dining and such. If not a change in ownership, then perhaps a different direction for the Devon cabbie destination in general? fastfoodsnob wrote: That's the thing about the Events board: if you're not actively cruising it, you can easily miss out on some great events. In addition to the Events Board Michael M, aka EatChicago, is keeping a mirror image on a LTHForum specific Google Calendar. I find the calendar useful and informative. Thanks for your efforts Michael. Cathy2 is probably doing more work on this than I am these days. Thanks, Cathy. fastfoodsnob wrote: If not a change in ownership, then perhaps a different direction for the Devon cabbie destination in general? I really hope it stays open!! I was just jonesing for some of this good food not too long ago.... oh well, this may mean it's time to check out "Mahboob" (cracks me up!). G Wiv wrote: In addition to the Events Board Michael M, aka EatChicago, is keeping a mirror image on a LTHForum specific Google Calendar. Thanks! I added this to my gmail as well. eatchicago wrote: Cathy2 is probably doing more work on this than I am these days. Thanks, Cathy. days, but has now reopened full-time, and is once again a 24-hour place. evidence, in exactly the same spot as it used to be. cabbies, who frequent either HH or Daata Durbar or both at nights. them, I think, and a whole lot harder. Hit Hyderabad House last night around 11pm with a couple of friends. Joint was rocking, restaurant was 3/4ths full, parking lot had two separate groups of 10-12 people in lively conversation, positive energy almost palpable. Food was dead-on mutton khorma, goat biryani, chicken masala, dal and multiple parata. A feast, including lassi, soda and tea, for three with leftovers for $33. Early lunch with my niece Emily, she's had Indian a couple of times, mainly in places that cater to more Americanized tastes, and was quite taken with Hyderabad House. We started with the more familiar, though at the end we moved into offal territory, which she was surprisingly comfortable with. Chatted a bit with Naseer, owner of Hyderabad House, who mentioned they were now serving some South Indian dishes, of which we tried Idly and Wada. We struck up a conversation with a couple at the next table turned they were LTHForum lurkers from San Francisco who said they originally read about Hyderabad House and Khan BBQ on LTH. Mr. Ibrahim was very excited* to see Chakna on the menu, a dish from his youth rarely seen in states. Chakna, a spicy mix of offal (kidney, heart, liver, tripe etc) had distinct notes of coriander seed, clove and, I think, allspice, very aromatic, spicy, but not over the top. Emily, much to Mr. Ibrahim, his wife and Naseer's surprise, was much taken with the dish, as was I. We rounded out our meal with a small shared portion of Dabelka Meetha, a buttery bread pudding. Delicious interesting lunch, hyper reasonable prices, good conversation and a friendly interactive owner. Hyderabad House, count me a fan. youth rarely seen in states. Well, sheesh, of course he was... as we say back in my 'hood, 'he mah cuz, yo'. (No, really, he actually is - ie not just an LTH-er by lurk, but also an LTH-er by blood...and food obsession can often run in the genes). Chakna, a spicy mix of offal (kidney, heart, liver, tripe etc) had distinct notes of coriander seed, clove and, I think, allspice, very aromatic, spicy, but not over the top. Emily, much to Mr. Ibrahim, his wife and Naseer's surprise, was much taken with the dish, as was I.
Chakna, BTW, appears fairly regularly on the Hyderabad House menu - its a special on a couple of days of the week IIRC (Iam going on memory, but it might be Wednesdays and Saturdays or some such?) A quite Hyderabadi dish, is Chakna, not sure how well its known (or how often its consumed) by others. However Hyderabad House is not the only provider of Chakna on Devon - "Naan on Devon" (or Nan on Devon, as they spell it), only 3 or 4 doors down from HH to the west, also has a weekly special of Chakna (I think their Chakna day might be Tuesday)... so, really, if one is in the mood for Chakna while on Devon, one's odds of finding it are not as long as one might expect (Id bet Daata Durbar probably has Chakna on some day too.. but I havent checked lately). One of my all-time favourite desserts, is Dabal Ka Meetha (meetha=sweet, dabal-ka, 2 words, = made of "dabal" or "double"). Also known as Shahi Tukde, ie royal pieces of dessert, or I guess dessert fit for royalty? At its best Dabal-ka-meetha can be a quite fantastic dessert - a sort of richer, heavier, creamier, superior flavoured bread pudding. Some of you might wonder why this sweet dish is called as ‘Double Ka Meetha‘. Milk Bread, which was especially bought from Rose Bakery in Hyderabad, with which this Meetha is prepared in India, is called as ‘Double Roti‘. This is because the dough increases to double its size due to the action of yeast, and Roti means ‘Bread’. So its Double Roti, and the Meetha is called as Double Ka Meetha. This dessert is also called as a king of Bread Pudding. Long time fan of Hyderabad House, but either my taste buds died a sudden death or lunch today was bland as Betty Crocker. Had a set meal, $8 for rice, chicken curry, daal, veg plate and two paratha, zero flavor, like spooning a Stuckey's gravy boat. I asked for some Achaar just to inject a little pizazz and found myself wishing I had a bottle of hot sauce in the car. I'm sure its an anomaly, be it my palate taking the day off or bland grub from Hyderabad House, I'll be back sooner rather than later to find out which of us was out of round. I still cannot get over the variably colored rice in the Biryani, just how do they do it? Quite easily. This is how I was taught to do it - first, you need to make an infusion of the saffron (usually in milk). Take something like a narrow chopstick & poke small (i.e. narrow diameter) holes into the rice/meat layer right down to the bottom of the pan (remember, biryani is cooked undisturbed, unlike risotto where its continually stirred, so you'll have a fairly even layer with a flat surface to work with). Using a small spoon then pour a few spoonfuls of the saffron infusion into each hole, then seal the pan to finish cooking. The saffron will diffuse out while the biryani finishes cooking, giving the most intense color at the bottom of the hole where it was first poured, but it'll be a lighter orange at the top of each one. When you open up the pan, you'll also see surface puddles of the orangeish color graduating to lighter & lighter yellow to the white on the top of the rice. The colors then get broken up when the rice is spooned out. The trick is to have fairly narrow deep holes & a very intensely orange saffron infusion in a small volume of milk before you start adding it. Great trick, Athena. I'm purloining it! Much obliged.